The iPad will be in your hands soon enough. And when it is, important documents, files, and folders you’ve stored in the cloud won’t be too far away, thanks to Box.Net. The cloud-based content management company plans to release an iPad-optimized version of its Box.net mobile app that’s already available for iPhone and iPod touch users. The free app should hit the App Store this weekend about the same time that the iPad arrives on retail shelves. Like its iPhone counterpart, Box.net for the iPad lets users access and share content stored with Box.net’s online storage service. iPad users will be able to browse through personal and shared files folders, view documents and media on their tablets, and share files and folders with others. Users will also be able to leave comments and feedback on files, while seeing updates on what’s been edited or revised with shared content. Box.net on the iPad sports a two-pane interface. A navigation panel lists all the folders and files you can access, while a tabbed interface lets you see any updates to shared documents. The other part of the screen features any document or file you’ve selected—you also have the option of a full-screen view of the document with access to the app’s main controls. That’s a bit of a departure from a Web-based interface, Levie added, where you navigate from one document to the next. 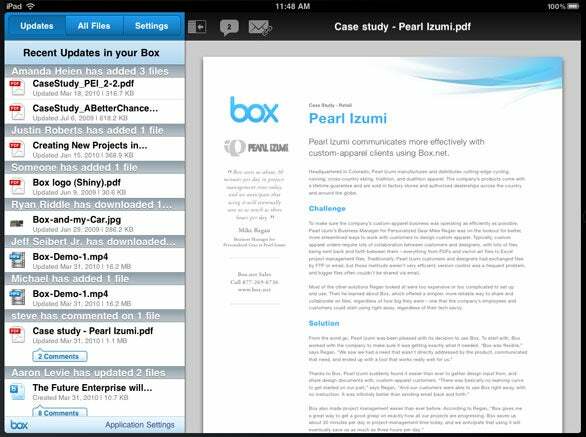 Having the navigation pane available in the iPad version of Box.net lets you view documents in their proper context. Not only is the Box.net iPad app a free download, you can also sign up for a free account with the Box.net service that gives you 1GB of Web-based storage. Individual and business accounts featuring more online storage and higher file size limits are available for a monthly fee.